Download "Chapter 8 The Stamp Act and Methods of Protest"
2 Page 34 With that, Henry offered the stunned delegates seven resolutions: 1. Resolved: That the first settlers to this county brought with them all the privileges and rights that have at any time been enjoyed by the people of Great Britain. 2. Resolved: That these privileges and rights have been guaranteed by two royal charters. 3. Resolved: That the right of self-taxation is a distinguishing characteristic of British freedom. 4. Resolved: That the Virginia Assembly has always had the sole power of self-government and self-taxation and that these rights have always been recognized by the kings and people of Great Britain. 5. Resolved: That the Assembly of this colony has the sole right and power to tax Virginians, and any attempt to surrender this power will destroy British as well as American freedom. 6. Resolved: That the inhabitants of this colony are not bound to obey any law except those passed by their General Assembly, 7. Resolved: That any person who speaks otherwise shall be deemed an enemy of the colony. Thomas Jefferson, who observed the scene from the entrance hall, described what followed as a "most bloody" debate. The conservative leaders of the Burgess rose one by one to denounce Henry's radical resolutions. How dare he place Virginia's law-making power above that of the British Parliament? In the heat of making his reply, some say Patrick Henry warned, "Caesar has his Brutus; Charles the First, his Cromwell and George the Third..." As the shouts of "Treason!" "Treason!" all but drowned out his speech, Patrick Henry waited before finishing,"...may profit by their example. If this be treason, make the most of it." *12 Five of Henry's seven resolutions passed the House of Burgess, the last by just one vote. All seven, however, were reprinted by most colonial papers. Thus Virginia's actions were given the appearance of an even more radical challenge to England's authority than they were. August: Riots in Massachusetts Inspired by Patrick Henry and the Virginia Resolutions, Boston patriots under the leadership of John Hancock and Sam Adams, organized the Loyal Nine and, later, the Sons of Liberty. This latter group took protest to the streets. Two of the objects of their anger were Andrew Oliver, a British agent appointed to sell the hated stamps, and Lt. Governor Thomas Hutchinson. The destruction caused by the group led Governor Francis Bernard to rush the following report to London: * Historians today doubt that the last exchange took place but the story has circulated for hundreds of years. 12 Nardi Reed Campin, Patrick Henry, the Firebrand of the Revolution, Little, Brown and Company, Boston, 1961. 5 Page 37 Suggested Student Exercises: 1. Define or identify and briefly show the importance to the chapter of each of the following: a. 4 forms of protest b. 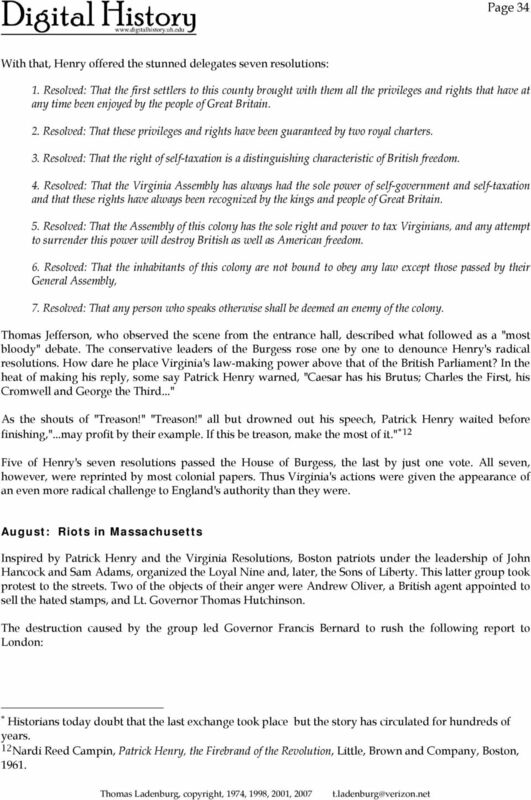 3 Virginia Resolves c. King threatened d. Sons of Liberty e. Andrew Oliver and Governor Hutchinson f. Stamp Act Congress g. 2 resolves of above h. boycott i. London merchants j. Declaratory Act Deciding Whether an Action in Justified When deciding whether an act of political protest is justified one should consider several of the following: a. The purpose or ends of the action: are the ends just? b. The alternatives to the action: could the same ends be reached with less provocative means? c. The method or means of protest: do the ends justify the means? d. The effect of the action: was the end obtained? Is the situation better as a result? It is a matter of personal judgment how important each of these considerations should be. It is important, however, that one develop a consistent philosophy incorporating ends, means, alternatives, and effects. 2. Arrange the following actions in order from least to most justified. State reason for each selection: a. Patrick Henry calling George III a sick king and denouncing all who disagree with his solutions as enemies of Virginia. b. Representatives from nine colonies petitioning the King and Parliament to repeal the Stamp Act. c. A mob in Boston destroying property and threatening the lives of Andrew Oliver and Thomas Hutchinson. d. Merchants in New York refusing to buy British goods or paying debts to English merchants until the Stamp Act was repealed. e. Tar and feathering merchants who sold British goods despite the boycott. 3. Using the criteria given above ends, alternatives, means, and effects decide whether use of violence in Boston was justified. Flipped Lesson 3A: 1763-1775: The Road to Revolution Duncan, Mike (Producer). (2014, Feb. 16-March 2). Revolutions [Audio podcast]. Retrieved from http://www.revolutionspodcast.com/page/3/ Remember 1. Virginia and the American Revolution VS 5 Scotland WHEN DID ENGLAND BECOME GREAT BRITAIN? The early 1700s Great Britain is the name of the island that consists of three regions: England, Wales, and Scotland. Causes of the American Revolution. SS4H4: The students will explain the causes, events and the results of the American Revolution. Renewed Warfare Among Europeans and Indians. English surrounded by hostile neighbors Indians, everywhere outside settled boundaries Spanish Florida region French along Great Inland System of Rivers St. Hear Ye! Hear Ye! Summative Assessment A for Independent- To Be or Not To Be? 4. After all groups have finished, have the groups share and explain their answers. The Stamp Act The twelve years following the conclusion of the French and Indian War were vital in creating an independent drive in the colonies that ultimately led to the outbreak of the American Revolution. Was the American Revolution Inevitable? Political. The colonists were strongly influence by Hobbes and Locke (Social Contract theory on how/why government originated). Lead: In the 1700s the United States broke from England. No colony in history had done that before. This series examines America s Revolution. 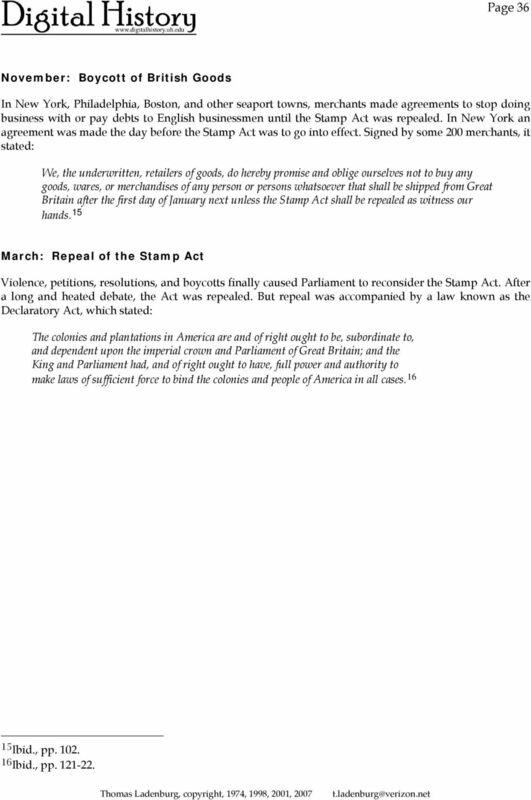 Volume 20 Number 016 America s Revolution (44) Stamp Act Repeal III Lead: In the 1700s the United States broke from England. No colony in history had done that before. This series examines America s Revolution. Decision Making: Hamilton s Economic Policies Part 1: The Debt PROBLEM The year is 1790, and George Washington has been President under the new national government, The Constitution, for about a year. THE BOSTON TEA PARTY: COVERT ACTION, INTELLIGENCE SUCCESS. Eric Casler Professional Category. 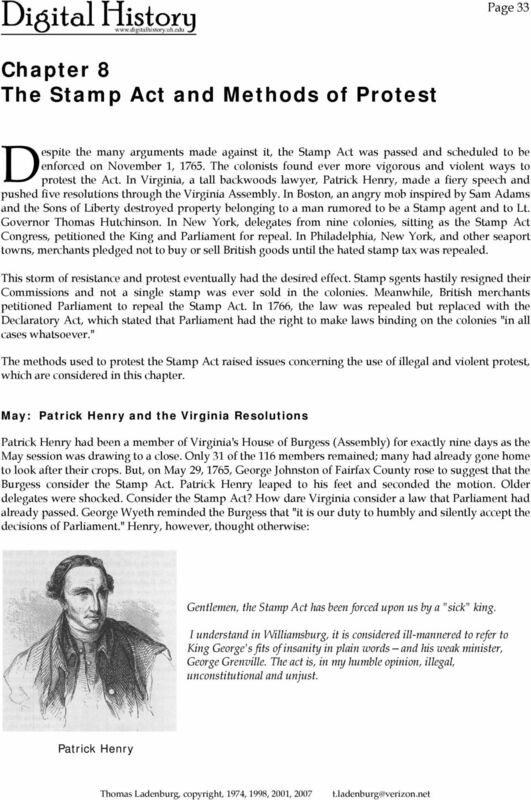 Stamp Act Lesson Plan. 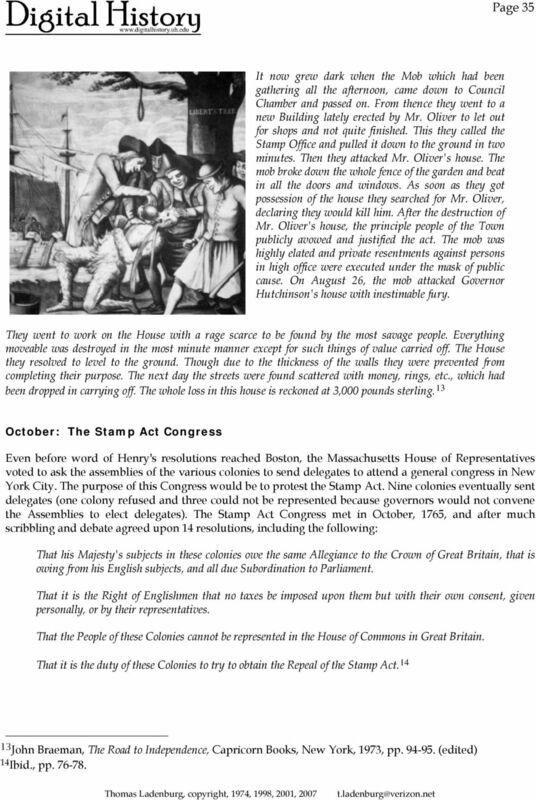 Central Historical Question: Why were the colonists upset about the Stamp Act? Loyalists. Who Were the Loyalists? The Causes of the American Revolution. I. Effects of the French & Indian War (Seven Years' War) 1. War ends with the signing of the Treaty of Paris. Name Date Mastering the Content Circle the letter next to the best answer. American Revolution 1. Before 1760, which statement best describes the colonies? A. The colonies had assemblies that passed laws. Sample Test: Colonialism and Foundations of America. Use the following map and your knowledge of Social Studies to answer question 1. Declaration of Independence Lesson Plan. Central Historical Question: Why did the Founders write the Declaration of Independence? Sugar and Stamps (part 2) Would the colonists have reacted differently to these taxes if they had had representa<on in Parliament? Grades 4 6+ The seven pockets in this book are filled with fun, exciting projects that students can proudly present in a unique book format. Colonial Influences STEP BY STEP. OPTIONAL: A PowerPoint presentation is available to walk students through the activities in this lesson. 17. WHO BECOMES PRESIDENT OF THE UNITED STATES IF THE PRESIDENT SHOULD DIE? 22. HOW MANY CHANGES OR AMENDMENTS ARE THERE TO THE CONSTITUTION? DEPARTMENT OF JUSTICE Immigration & Naturalization Service 100 Typical Questions 1. WHAT ARE THE COLORS OF OUR FLAG? 2. HOW MANY STARS ARE THERE IN OUR FLAG? 3. WHAT COLOR ARE THE STARS ON OUR FLAG? 4. Unit 2 Review Game. 3. Name 1 way the French & Indian War changed the relationship between Britain and their American colonies. 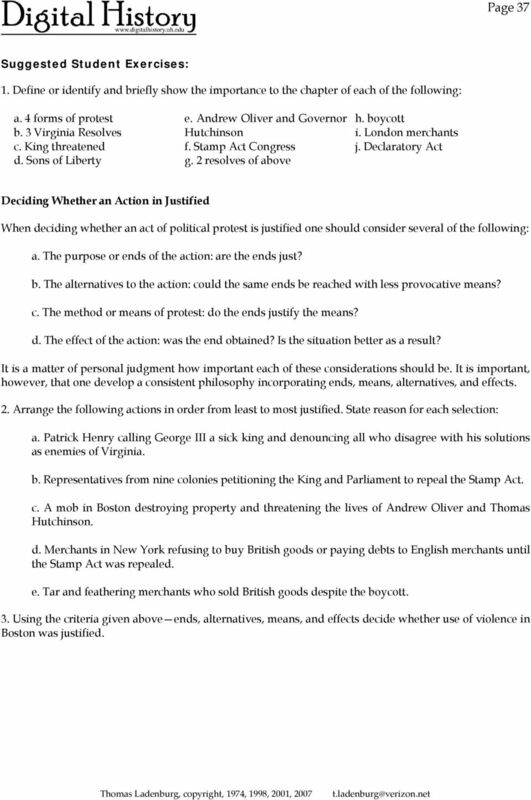 Name: Date: Section 8-1: The Articles of Confederation Chapter 8 Section Review Packet 1. Constitution 2. Republicanism 3. Limited government 4. Suffrage 5. Articles of Confederation 6. Ratification 7. Unit: 04 Lesson: 03 Suggested Duration: 3 days Grade 05 Unit 04 Exemplar Lesson 03: No Taxation Without Representation This lesson is one approach to teaching the State Standards associated with this unit. champions OF FREEDOM [Thomas Jefferson] was...a walking Library, and...the Genius of Philosophy ever walked hand in hand with him. Mercantilism and the Act for Advancement of Trade HISTORICAL THINKING SKILLS: Standard 5 - Historical Issues Analysis & Decision-Making; 5B. Compare the interests and values of the various people involved. First Continental Congress, Second Continental Congress, & the Declaration of Independence Overview Students will explore the Revolutionary period through the choices made by the Second Continental Congress. Economic: o Slavery is cheaper than indentured servitude. o Slave Trade. o Tight packing vs. loose packing. o Large Plantations.